Noir: A Love Story by edward j rathke is forthcoming this summer from Civil Coping Mechanisms, and I had the opportunity to pose Edward J Rathke some questions inspired by his phenomenal book. I used to hate my real name. I used to hate it so much. I hated the way it looked on paper and I hated the way it sounded, rolling round my ear, those two stupid hard consonants just a few letters apart. I’ve made a thousand names for myself over the years and most of them nothing like mine. I lived in worlds that only existed inside my head and I made me new. For a long time I hated my face too and I avoided mirrors like they were plagued and I stopped remembering properly what I look like, and this problem persists. The person I see with my name when I close my eyes isn’t the one who smiles back in the mirror. Even my dreams stopped being about this name and this body. I became other men and other women and I dreamt in their bodies, with their names. Now I’m comfortable with the name I was given so long ago: edward j rathke. I even have a supervillain name ready for whenever I fracture apart and try to take the world apart: Wrath Key. But is edward j rathke the best at answering these questions? Probably not. He’s a very silly human, though he sort of writes the opposite of silly books. Sometimes he wishes his novels had more silliness, way more zaniness, but we suppose writing is where those heavier parts of him go so that he can go on living silly, lightly, while we write on, Deathly. What’s the story you always tell? What’s the story you’ll never tell? I don’t know if there’s a story I’m always telling people. Probably there is, but the ones I feel like people are always asking me about are the ones where I almost died. Like the time I took a 60 foot freefall onto rocks or the time my appendix exploded while I was in Korea and I spent a week in a hospital where no one spoke English. Most of my stories involve me being lost and making bad decisions. There are so many stories I’ll never tell but not because of fear or shame or regret. There are memories that are sacred to me. In many ways they’re all we have as humans. Our life is just a collection of memories, and memory is largely a creative process of stitching together misremembered moments. When you share a memory, it stops being yours. So when you speak your memory into new ears, that memory becomes theirs, and in that transference, the memory changes twice [first by making it into words and then again by the person hearing those sounds, stitching it to the fabric of their life] and becomes something new. If they share that memory, it again transforms, and so when your memory is shared with others, it stops being yours and becomes something wholly different than who you are, which is a body housing memories. And so I keep the best ones inside and I share them with no one. Not even in my fiction, and definitely not in interviews like this. Most of them are about love. Those howling bits of time, fraying, hoping. And maybe Noir: A Love Story is both. It’s full of the story I’m always telling—the unknowable humanity, the howling ache chasming between us, the sublime perfection of existence, the beauty of its ending—and the ones I’ll never tell. 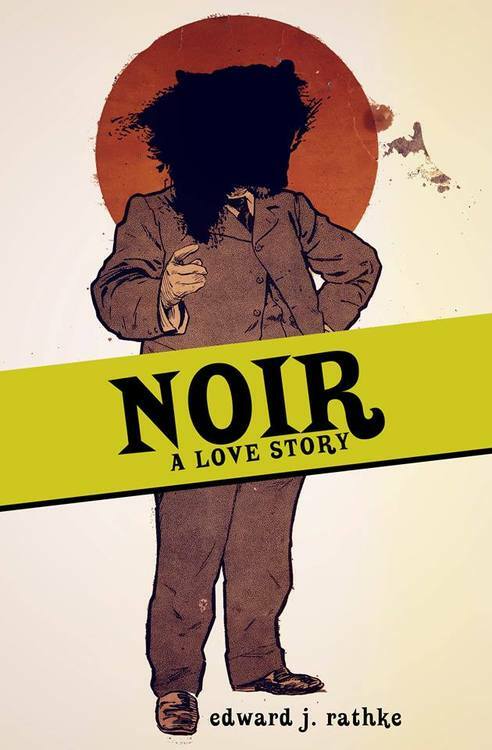 All those stories I’ll never tell, those are the ones at the center of Noir: A Love Story. I’ve given you the impressions of lives but told you nothing about what they mean to the people who lived them, and so the reader decides and discovers. In that discovery, they’ll probably find the many mes that I’ve been all these years. What does desperation make you do? Desperation’s made me do a lot of things. I’ve lived a strange life full of stranger existential crises. Desperation sent me to Ireland and South Korea. It’s sent me wailing into the night. It’s sent me down roads of destruction, but I’ve also poured it over thousands of written pages. When I was younger I didn’t sleep really at all—still don’t, I guess, though mostly out of habit—and that was something deep and dark gnawing at me all my life. Then while still too young I spent those sleepless nights drinking, causing chaos, writing terrible poetry and screaming it into the sunless sky, breathing smoke on rooftops. “Time eats you. Dead or dreaming” What else? I have strung wires from steeples to stars and tightroped across the sky. Which legend has got it the most wrong? I sing to her a song but it’s always wrong. We’re out of tune and she’s gone too soon. That’s how I feel about most legends and myths. Legends aren’t wrong, but we make them wrong. We hear and understand them wrong. We even write and believe them wrong. Probably that’s why I’m always making up new myths. They’re stories and in them we learn how to be human. We learn what it means to be alive, to have a life, and to have our life belong to other lives. We learn that what’s mine isn’t simply mine or yours but all of ours. We learn how to love and we learn why hate is a waste. And it is a waste. We learn that anger and violence are absurd—more than that, they’re incorrect—and I think the real message to many legends is that life itself is absurd. Magical and beautiful and horrifying, but absurd, and probably meaningless, or at least purposeless. So maybe that’s what they get wrong: that our specific lives have a purpose or mean something beyond the moments we exist. Life is just life. Every moment is unbearably glorious and our lives are extremely important to the other lives we’re bound and tangled with, but being alive is probably the most absurd possible. The only thing more absurd is that we have the cognitive structures and faculties to consider and reflect upon the fact that we exist at all, that we can comprehend that who we are is a brain caught in a bag of meat and concrete and soup. And the strangest thing about that, is that the meat really matters, and that the brain itself is just a coiling bag of fat. Our brain changes our body and behavior and our body and behavior determine the way our brain works. It’s really an amazing thing, but I think I’m getting distracted by neuroscientific nostalgia. Despite all the absurdity and nonsense and purposelessness, I enjoy existing a great deal. Though I’ve had my share of terrible moments, I’ve loved every instant of my life and I intend to go on existing, at least for a while. I won’t miss it when I stop, but I think any legend that insists that this life is a test are most wrong. Describe a stranger you remember. I’ve met so many beautiful strangers in my life and most of them remain strangers. I used to have the most exciting times of my life after I left parties, usually after 3am, and I’d meet these strange people on the street and I’d hangout with them till morning, and then I’d go back home and never even really think about them again. But there aren’t really many I remember, I guess, because the ones I remember end up just being actual friends. Or like my girlfriend, who I met by such random and coincidental circumstances while she was living in France and I was just wandering through. There’s no reason why we should’ve met or even talked longer than half an hour, but it’s been two years together now, and she moved across the country to make it work. Though, thinking about it now, and thinking about my appendectomy from a few questions ago: I woke up from the exhaustion of recovery to someone stroking my hair. I opened my eyes and it was a middle aged man. He looked sad but he kept stroking my head and I guess I thought that was okay because I let him. I think it was still Easter but it could’ve been a few days later. Anyrate, the guy, the only thing he said—maybe the only english he knew—was, My son. He just stroked my hair and said, My son. I smiled at him and he smiled back, wanly. I fell asleep soon after and when I woke up he was gone. He was kind. I think about that often. Which dream feels the most real? There’s always really only been one dream, and I guess that’s why Noir: A Love Story. That’s why all the novels I’ve ever written are all connected, all secretly about the same thing, all dancing along the same mythology. For years and years I had the same dream and I had it every night. I forget when it started but I was probably between four and seven. Sometimes I think maybe that’s why I didn’t sleep or maybe that’s the reason I slept at all. In the dream there was nothing. It was a halflit world, a sort of greying light spread sheepishly. And then there was a girl, always in silhouette so I couldn’t really see her. She was just this outline of a human. As years went by the dream grew and she began walking towards me through the halflight. As she came closer and closer, I saw her clearer but still I never saw her face. And this went on until a few years ago when she sometimes spilled out of dreams. I sometimes dream about her still, but I’ve never known her, though she’s been here probably always. That’s the one that feels the most real, that feels deepest inside and outside me. Sitting at the Budapest airport a few years ago was the last time I thought I saw her. Everything. Nothing. Too much and too little. When was the last time you were dead? I think we spend a lot of our lives dying and mostly go on out of habit. You learn life the same way you learn to walk and talk. If no one taught us to keep going on, maybe we wouldn’t. I think about that a lot. I think about dying probably more than is normal. It’s one of my greatest obsessions, along with wolves and ravens and dust. I see Death everywhere, hear it singing beautifully, feel it clinging Deathly. It’s Izanami and Izanagi. It’s Orpheus and Euripides. I’ve always dreamt of that, of refusing Death not out of narcissism but for love or any other reason, and I think Noir: A Love Story is an Orpheic text, though I’ll likely be alone in that belief. Everything I’ve ever written is about love and Death, and I’ve been in love and in Death so many times it’s sometimes felt like I forgot to go on living. There are a thousand kinds of dying. I remember dreaming of dying a thousand thousand times but always the same way. That’s the perfect nightmare, I think. There’s a beauty to eternal recurrence, but only if you can make that act of dying slightly different each time. But in this dream I just kept getting run over, and it wasn’t the dying that bothered me but the way I felt like I was trapped in a torturous videogame, where I kept getting gameovers in the exact same way, at the exact same time. It’s variety we need, and if you’re going to keep on dying the same way, then why bother dying again at all? The last time I died was in South Korea. I was alone at night and the ghosts became too much, the weight of the mountains pushed the air in and took my brain out. I was crushed and debilitated. I was crippled and helpless, 6,000 miles from everyone who knew and loved me, and a hole in the earth opened before me, and I just kept falling, and falling forever like that felt similar to dying always the same way. I just kept falling and falling until I realized I wasn’t falling but flying. It took me months to realize that and it was probably hundreds of hours of ballet that grew my wings and let me find solid ground again, to remember what it was to be human, to be alive, and I wrote Twilight of the Wolves later that year, and I never thought about it till now but I think it was my way of dealing with what it means to be human, to be alive. It’s original title was To Live, and I still think of it with that name. And, you know, it was actually writing that novel that killed me most recently. 100,000 words in two weeks while teaching full time sort of caused this strange collapse in my brain, and then just a few weeks later I was flying back to america, hoping to fill my lungs with the world I didn’t really remember. But writing really brings me to life. It’s the cure and cause of everything beautiful and horrible in my life. edward j rathke wrote Ash Cinema [KUBOA Press, 2012], Twilight of the Wolves [Perfect Edge Books, 2014], Noir: A Love Story [Civil Coping Mechanisms, 2014], and various other things. He edits and contributes at Entropy and Monkeybicycle. FInd him at edwardjrathke.com.